Chris Kyle (Bradley Cooper) is a bull rider and thinks he is a cowboy, but he also knows deep down that he is meant for more in this life. Shortly after signing up for the military, he meets Taya (Sienna Miller) at a bar. The two become close and eventually get married shortly after 9/11. During their wedding, Chris gets the call that he is to be shipped to Iraq to fight in the war. While there, he eventually becomes known as "The Legend" since he is such a good sniper. Back in Texas, Taya must adjust to life with 2 children, always knowing that her husband could be killed at any second on the battlefield. Chris must balance his military life with his home life, but has a hard time adjusting to being present while he is home. In this film based on true events, in total, Chris Kyle served four tours in Iraq and holds the record for the deadliest sniper in U.S. history with 150 confirmed kills. From a film critic's standpoint, this movie is really good. There are a lot of excellent aspects to it, the biggest being Bradley Cooper (and we mean big because DAMN, he got swoll for this movie), who shows that he has acting chops beyond his stint in "The Hangover" franchise. Cooper gives one of the best performance of his career as Chris Kyle. Cooper is able to bring the deeply touching human elements to Kyle as a person; this is seen both when Kyle is stateside, while in the arms of his wife or while playing with his children, and in the thick of battle during the most brutal times of war. We get to know Chris Kyle, the person, as well as his wife Taya, their flaws and all. We connect with them individually on more than one occasion, and though their chemistry together didn't always elicit the "tug at your heartstrings" responses we believe filmmakers were going for, this in no way diminishes the tremendous performances both Cooper and Miller give throughout the movie. We hate to bring it up again, but this is something that another recent war film, "Unbroken," failed to do, and we appreciate getting to know more about these characters than just their generalities. 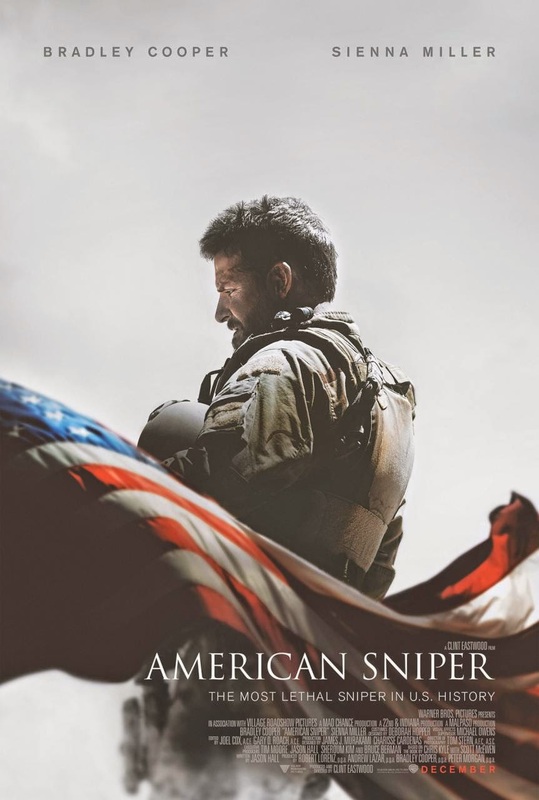 This being a biographical film, it's hard to tell where the lines of fact and fiction get blurred in the name of dramatization, and while it seems like a hefty amount of this film portrays true events, the entire major plotline about dueling snipers is absolutely fabricated in relation to Chris Kyle. In doing so, this film turns Kyle's life into an "Enemy at the Gates" scenario, except now, instead of Russian sniper Jude Law having an ultimate showdown with German sniper Ed Harris, Bradley Cooper is up against a super-trained, mysterious precision fiend and former Olympian named Mustafa. Kyle's real-life probably housed enough dramatic details on its own, so why make this part up? BigJ didn't seem to mind this as much as I did. Another point that this movie makes clear is that Chris Kyle obviously had a lot of flaws and issues, especially with anger. This may beg the question, was killing all in a days work, or was it something he longed for after the day and the job was done? Shortly after Kyle and SEAL Team 3 ended up in Iraq, there was a point at which I thought, "huh, I thought this movie would be bloodier." Almost immediately after that thought, all hell broke loose. There is a hefty dose of gritty carnage and often grotesque violence throughout the film and some of tensest moments in the throws of war deal with children. In fact, a good portion of the audience had physical jumping reactions when these events were happening on screen. There were at least a few times where I felt physically uncomfortable sitting in the theater watching what was taking place. I couldn't figure out if this was a good or bad thing. On one hand, that means that Clint Eastwood, the film's director, and his actors did their jobs and got a rise out of moviegoers, whether good or bad. On the flip side, it was hard to watch what happened during the war in Iraq on both sides of the battlefield knowing that it is a true story. "American Sniper" makes it very clear who the enemy is and there are no bones about it, but it also implies that our own actions as understandable savagery. While the Taliban are inhumane animals, our retaliation, be it through sniper fire or otherwise, was all justifiable brutality for unjustifiable acts of pure evil. This film is not without its flaws and technically, there are some aspects we didn't care for. Many of the shots looked like they were filmed with a Go-Pro or a handy-cam. These shots were distracting and made us think, "oh yeah, we're watching a movie." It sort of took us out of the element. Also, there were several distracting phone calls between Cooper and Miller during actual battle scenes. What the hell? Do soldiers really call their spouses while they in the middle of a firefight? We're sure Kyle and his wife called one another many times while he was overseas, but these calls were both utterly confusing and whiny, too. They were annoying, unreal and seemed to be left in the movie for dramatic emphasis only. Again, it took us out of the element of the film. It also felt a bit repetitive, though this is the nature of Kyle's story since he did multiple tours in the military, so we can't hold it against the movie, but feel it must be noted. Another thing we noticed was that the end of the film felt rushed. Since this is a true story, it's not a spoiler to say what happens, but it feels like Eastwood made the decision to speed through the final 1/4th of the movie and thus, the most climactic portion of the movie is glossed over rather quickly. "American Sniper" doesn't shy away from the fact that war is a dirty business and that we as a country do bad things in times of war, and this will definitely polarize some audience goers. Now, I must preface: I was someone who did not support the act of going to war in Iraq and actually protested it in marches. This does not mean I didn't or don't support the troops. These people have laid down their lives for their country and continue to do so voluntarily, which is commendable, but the act of war itself is a hard subject to agree upon. I was young, but I still feel the same way about it now. Love it or hate it, this is the truth of the matter. Watching this movie gave us the sense that it wanted us to get reinvigorated with the entire situation that put us "there" in the first place. We feel like it wanted to make audiences "take up arms" for the country again. We are from a military town, or as I like to put it, "two blue dots in a sea of red." If we had to guesstimate, over two-thirds of the people in attendance during our showtime were military, past or present. Many people will feel differently, but the anti-Muslim and anti-Middle East sentiment I have seen on the internet since this film was released a few days ago is NOT the right way to feel about it. Clint Eastwood is no stranger to politics and he has always made his own views known, and in using him as a director, this film definitely has a crystal clear agenda behind it. This is one of Clint Eastwood's better movies in years, though, and this is coming from one of about a dozen people who liked the film "Jersey Boys." Though there are some obvious technical flaws, "American Sniper" does an admirable job at trying to bring Chris Kyle's story to light. We also feel like this was much better than "The Hurt Locker" or "Zero Dark Thirty," though we didn't see those films in the theater and it may have hurt our perception of them a little bit. Let's face it: the Academy has a raging hard-on for war movies anyways, and this is obvious since we were able to just reference not one, but two post-9/11 films from just the last 7 years that were nominated for Best Picture, with one of them even winning the ultimate prize. We still liked "Fury" better, even though that wasn't a true story. All in all, this is a decent film, regardless.